There is no country on Earth with a perfect human rights record. Saudi Arabia, the main American ally in the Middle East since the 1970s, is no exception. Originating in an 1945 agreement between U.S. President Franklin D. Roosevelt and Ibn Saud, the nation’s founder and first king, the Saudi-U.S. partnership gained great significance following the country’s discovery of immense oil reserves and the overthrow of America’s main Persian Gulf ally, the Shah of Iran. Since then, Washington and Riyadh have cooperated on a vast array of issues: King Khalid joined President Jimmy Carter in funding the Afghan Mujahideen against the 1979 Soviet occupation, and in 1990 King Fahd agreed to host more than 400,000 American soldiers during Operation Desert Shield and Operation Desert Storm. Saudi Arabia is also one of the United States’ main partners in counterterrorism activities in the Middle East, and in May 2017 President Trump, King Salman and Crown Prince Mohammad bin Salman agreed to a $110 billion arms deal, which included advanced missile defense systems, tanks, frigate-type warships, and cybersecurity technology. The relationship, however, is highly controversial. To quote comedian John Oliver on his HBO show, “for decades, we’ve had a relationship based on strategic interests, not shared values.” Saudi Arabia has committed of a myriad of human rights abuses, including the recent assassination of Washington Post journalist and American resident Jamal Khashoggi, which the CIA concluded to be the work of Crown Prince Mohammed, thousands of civilian deaths in Yemen due to Saudi intervention in its civil war, abuse of foreign workers (which make up a significant portion of the Saudi labor force), and the jailing, torture and execution of dissidents. Women still require the consent of a male guardian to marry, attend school, obtain a passport, or be released from jail, and they have only been permitted to drive cars since June of last year. Homosexuality is a crime punishable by death. Furthermore, Saudi Arabia promotes and funds its state-sponsored, ultra-conservative variant of Islam, known as Wahhabism, around the world. This ideology advocates for intolerance and violence towards the unfaithful, including non-Muslims and Muslims who they claim venerate figures other than God, including Shias. Wahhabism directly influences numerous terrorist groups, including al-Qaeda and the Islamic State; according to Daniel Benjamin, former U.S. State Department Coordinator for Counterterrorism, both groups are “rooted in the hate-filled religious doctrine, curriculum material and money that Saudi Arabia pumped out to the wider Muslim world.” Should America’s main Middle Eastern ally really be a country which spreads hateful ideologies which fuel terrorism, and treats its populace with such brutality? Should the U.S. abandon or weaken its alliance with the House of Saud? If so, which nation would become our main ally in the region? A Saudi airstrike in Sana’a, the capital of Yemen. Saudi involvement in the Yemeni Civil War, along with its oppressive domestic policies, spreading of radical Wahhabi teachings, and the recent murder of Jamal Khashoggi are among the key controversies surrounding Saudi Arabia. America’s weakening of, or withdrawal from, the Saudi-U.S. alliance due to the House of Saud’s poor human rights record could potentially do more harm than good; there have been several instances of American influence inspiring progressive change in the country. In 1962, in direct response to a private meeting with President Kennedy, King Faisal bin Abdul Aziz implemented reforms including the abolition of slavery and the promise of free healthcare and education; on November 6, 1990, due to the presence of Western soldiers and civilians during Operation Desert Shield, 45 Saudi women drove cars in Riyadh in protest of the kingdom’s ban. Therefore, America’s close relationship with the Saudis has proven to inspire reform within the country, and its removal could remove a potential force for moderation. In addition, America’s close alliance with Saudi Arabia has yielded significant dividends in the past, not just for the U.S. and the Saudis, but for the wider world. For example, in 1999, the Saudi Ambassador to Washington, Prince Bandar bin Sultan Al Saud, and President Clinton helped to diffuse a short but bloody armed conflict between India and Pakistan, both of which were equipped with nuclear weapons, known as the Kargil War. The conflict led to the Pakistani Prime Minister Nawaz Sharif’s disposal by his military Chief of Staff, Pervez Musharraf. The two parties negotiated for Sharif’s peaceful exile, which prevented his execution and potentially destabilizing riots. Saudi Arabia was essential to this peace process - according to former CIA official Bruce Riedel, while “the United States had little leverage with Musharraf” following the American denunciation of his coup, he says “the Saudis had clout with the Pakistani army”, and that General Musharraf “would almost certainly [have had] to agree” with King Abdullah and Prince Bandar. The alliance between the United States and Saudi Arabia calmed political turmoil in the region, and averted a war between India and Pakistan. In addition, while Saudi Arabia would still contribute to counter terrorist efforts with or without U.S. assistance (radical Islamic terrorists have attacked Saudi Arabia in the past), it makes sense that the two powerful countries should work together to fight a common enemy. Therefore, with Saudi Arabia and America’s vast wealth, power, and influence, the alliance can be used to promote peace in the region. 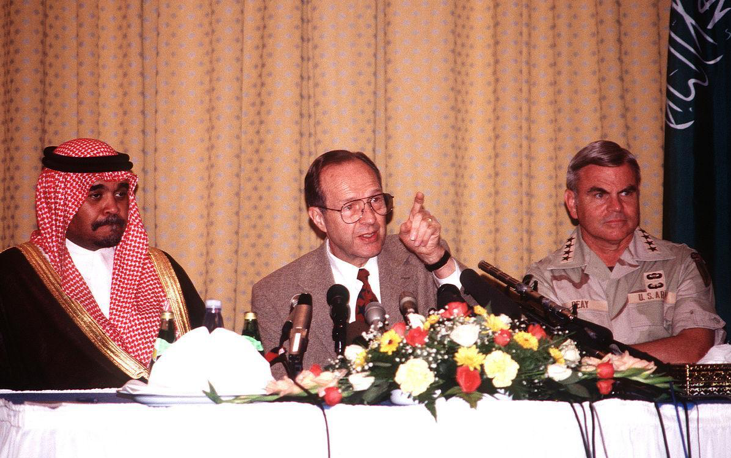 Saudi Prince Bandar bin Sultan al Saud (left) at a press conference with U.S. Secretary of Defense William J. Perry and General J.H. Binford Peay III after a terrorist attack in Khobar, Saudi Arabia in 1996. Washington and Prince Bandar were instrumental in diffusing a 1999 conflict between India and Pakistan, as well as a Pakistani coup d’etat. Therefore, it could be said that the U.S.-Saudi alliance should be maintained as is because the two countries are so vastly different, not in spite of it. Direct and indirect American influence has brought legitimate progressive change to the country, and change could happen again if Washington continues its close relationship with Riyadh. Additionally, if America attempts to shift power in the region and fails, there will be significant consequences. While Saudi Arabia is not reliant on American financial aid for stability (it receives next to no monetary aid from the U.S.), and has one of the largest militaries in the Middle East, a decrease of American assistance could lead some countries to attempt to tip the scales in their favor. Iran, for example, also has one of the strongest militaries in the region, and is one of Saudi Arabia’s main rivals. Tehran is more than a match for Riyadh militarily. While Saudi Arabia has a better equipped armed forces (much of it American stock), its effectiveness is questionable. The Saudi intervention in the Yemeni Civil War, for instance, has been unable to evict the Houthi rebels, and has killed far too many civilians to count. The Iranian armed forces, while less advanced than Saudi Arabia’s, are larger and supported by a strong domestic arms manufacturing industry. Iran is also considered an expert at asymmetric warfare, successfully using tactics such as speed boat swarms against Iraq in the Iran-Iraq War. Iranian units also have battlefield experience; the Quds Force, an elite Iranian Revolutionary Guards unit which specializes in intelligence and unconventional warfare, has seen fighting in Syria and Iraq. Therefore, should America loosen its backing of Saudi Arabia, other powers with similarly oppressive and violent policies could gain an advantage in the region. Speed boats of the Navy of the Islamic Revolutionary Guard Corps (IRGC) during a military exercise. Fast attack boats such as these are one of Iran’s tools for asymmetric warfare, which the country is known to be skilled at. After the carnage inflicted in Yemen by Saudi involvement, and the murder of Jamal Khashoggi by the Saudi royal family, it is evident that something must change in Washington’s relationship with Saudi Arabia. By continuing to support them regardless of the actions of the regime, the United States emboldens Saudi Arabia to commit egregious acts, by showing that their actions will be without consequences. As John Oliver points out “when you set no boundaries on an oppressive regime, they are always going to ask themselves ‘How much can we get away with here?’.” Also, the fact that one of America’s strongest counterterrorism partners is also one of radical Islamic terrorism’s primary ideological supporters seems counterintuitive, to say the least. However, there are many reasons to avoid cutting Saudi Arabia off completely, - doing so could prove destabilizing for the region, and remove a historically successful progressive force on the fundamentalist Saudi society. Thus, Washington should look for ways to exert its influence on Riyadh, such as a cancellation or reduction of current and future arms deals, without threatening the stability of the regime, which could have dire consequences for the entire Middle East. However, if America wished to shift its weight behind a less oppressive state in the Middle East, and form an alliance strong enough to ensure regional stability, which state would be the best candidate? The next part of this article will look at possible choices for Washington’s main ally in the Middle East. Riedel, B. (2018). Kings and Presidents: Saudi Arabia and the United States since FDR. Washington, D.C.: Brookings Institution Press. Operational Environment Assessment: Iran. (2010). Ft. Leavenworth, KS.